The name says it all: a control room’s main purpose is the same today as it has always been. What has changed, and continues to evolve, is the functionality at control room staff’s fingertips, and the types of human- machine interfaces they use. Keeping pace with the technological advances has been a growing modern awareness of the importance of aesthetic and ergonomic properties to an efficient operation. Progroup Manufacturing specialises in the design and making of exhibition stands, shopfitting and security consoles, and the company’s Angelique Roos provides insights into some of the latest trends in control room design. 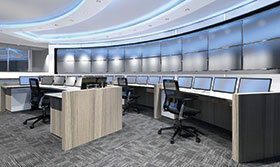 “In our experience the main theme in control room design nowadays is a clean, modern-looking environment incorporating the client’s corporate colours, personalised graphics and lighting. The use of good quality materials and introducing touches of wood grain make for an appealing work environment,” she says. Companies have also become more aware of ergonomics, she says. Some of the most important ergonomic features commonly installed include wrist rests for mouse and keyboards, typing stands, footrests, adjustable screen brackets and ergonomically designed chairs. It is also important that worktop space is sufficient for specific job requirements, that the desktop height is correct, that monitor distance and height are optimal for viewing angles, and that reflections from surfaces are minimal. “Taking into account that operators are at their workstation for 10 to 12 hours or more, a comfortable working environment increases productivity and decreases operator downtime and errors,” Roos concludes. For more information contact Progroup Manufacturing, +27 (0)11 493 1545, www.progroup.co.za.